An Afghan man covered his face by the dust crossed into Pakistani side of the Pak-Afghan border, towards to Pakistani border town Chaman along with Afghanistan border on Wednesday 24 December 2014. Photo by Matiullah Achakzai. Bannu: Among Ali Khan’s meager belongings are tents, dolls marked with a logo of an international donor agency, some bed sheets. But given the immense heat of the plains where he and his family have sought refuge, it is the pedestal fan and solar plates they values most. Ali Khan is packing up again to shift his family to Afghanistan via Kurram Agency. Soaked in sweat, Khan said he and his family had decided to shift to Afghanistan as frequent power outages, swarms of mosquitoes and the rising summer heat of the plains was unbearable. “It was a mistake to come here from Afghanistan where weather remains cool throughout the year,” Khan said. He stopped to load his belongings on the pick-up truck he has hired to take his family to Kurram Agency from where they intend to cross the border into Afghanistan. Seasonal migration has always happened between Pakistan and Afghanistan, especially among the nomadic Kutchi tribes that travel down to plains in Pakistan during the freezing winters of Afghanistan and back when it gets hot in the plains during summers. But increasingly now, refugees from Afghanistan and the internally displaced people from the tribal areas have been moving back and forth, seeking relief from their hardships, including the harsh weather conditions. Ali Khan’s family is one of many that have decided to shift to Afghanistan as the plains start to bake with the rise in mercury. Contrary to claims on part of the government to exempt the internally displaced people from excessive power outages to manage energy crisis, they complain of long breakdowns spread over 18 hours. In the rural areas, some say, they don’t have electricity for as long as three consecutive days. “Even in the township where residents pay their electricity bills, the power supply is erratic, often gone for long spells,” said Hissam Dawar, a resident of of Bannu Township. 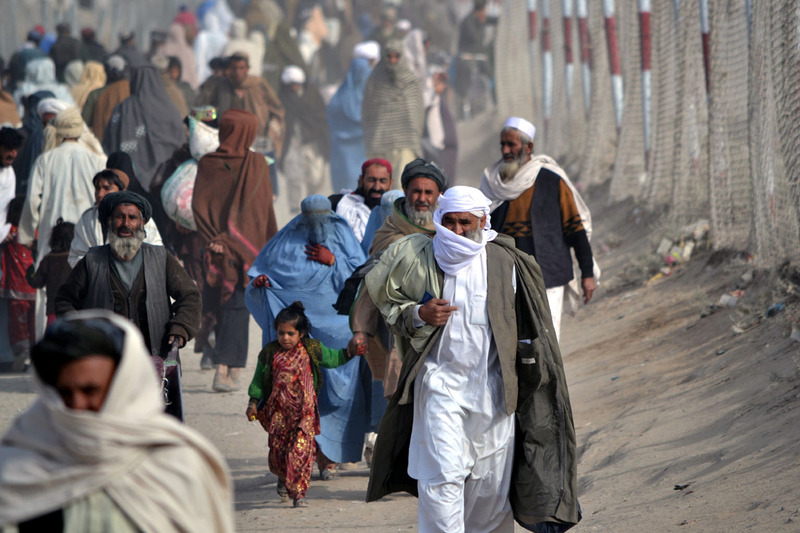 According to the official data available with News Lens, more than 30,000 families migrated to Afghanistan after the Pakistan military launched operation against local and foreign militants on June 15, 2014. “These were families living close to the border areas like Datta Khel, Shawal, and Ghulam Tehsils of NWA,” said an official of political administration of Miranshah, the main town of NWA, on condition of anonymity. He said most of them came back to Pakistan as they could not get the same incentives provided here. But with the arrival of the summer season, the hot weather in Bannu is getting unbearable by degrees for the dwellers of cold areas like Shawal, Datta khel and other parts of NWA. “Harsh weather, long power outrages, joblessness, excess of mosquitoes and the attitude of the landlords are the factors that force tribesmen to shift to Afghanistan,” said Noor Behram, a displaced journalist form North Waziristan residing in Bannu. He said 10 to 12 families shifted to the neighboring country daily, especially those with relatives in Afghanistan. On one hand the government is claiming to send back the IDPs to their homes while on the other those who can manage to cross over to Afghanistan to escape the harsh weather conditions are choosing to leave for the neighboring country instead of NWA. A displaced person from NWA said he had no trust in the claims of the government and it may take years for them to return home. “It will possibly take several years, maybe even a decade like the Mehsud tribe from South Waziristan Agency that has remained displaced for more than seven years now,” said the IDP, wishing not to be named for reasons of safety. Since March 31, 2015, about 200 families have been repatriated to Tehsil Spinwam of North Waziristan but residents allege that the operation never took place there and that is why they could return. “I am not satisfied with the return schedule of the government until those who have been affected by the military operation are sent back,” said Spin Khan from the Mirali town in NWA. He said the real victims are the residents of Mirali and Miranshah. About 1.7 million people from NWA have been residing in Bannu and the the adjacent areas of Lakki Marwat, Karak and Dera Ismail Khan. All of these areas are the hottest in KPK in summer. With the heat rising in the plains, IDPs are worried for the summer season while their hope to return home is diminishing with every passing day. A majority of the displaced people of NWA are of the opinion that the harsh weather, long hours of load-shedding, absence of job opportunities, behavior of the local landlords and lack of health and education facilities are forcing the displaced to look for better places. Those who can go to Afghanistan say that they can find work in Afghanistan and even if it means hard labour, the weather there makes it bearable.